To travel the Pony Express, riders had to brave apocalyptic storms, raging rivers, snow-choked mountain passes, and some of the most desolate, beautiful country on earth. To honor the sun-dried memory of those foolhardy horsemen, we dispatched Will Grant and a 16-year-old cowboy prodigy to ride 350 miles in a hurry. It took us 60 miles and two days on the Pony Express trail to lose our horses. 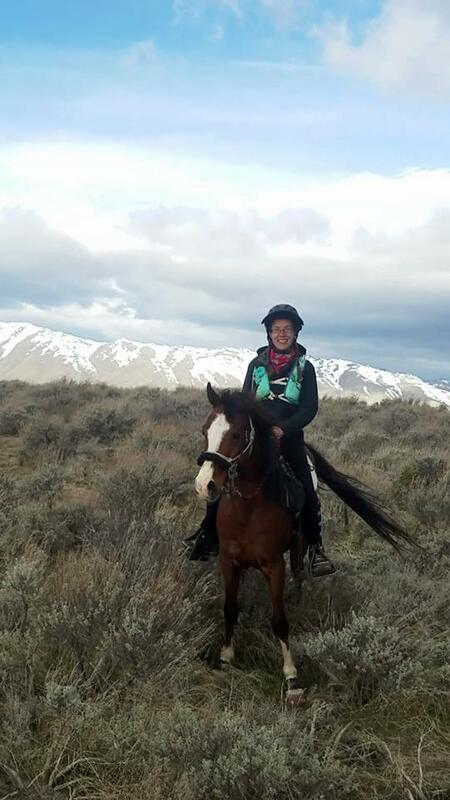 That morning, the four of us had hauled out of Granger, Wyoming, near the Utah state line, with a tailwind blowing scarves of dust before our cavvy of nine horses. 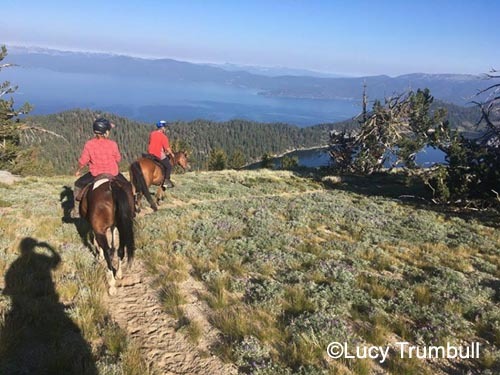 We were rich in horseflesh but shy on ex­perience, and we took our horses’ quiet demeanor as evidence that all nine had set­tled into the ride. We were mistaken. Red - tude? In case you aren't familiar with it, it's that go getter attitude that seems to belong to those dang redhead horses. Thunder is a pumped up, get outta my way and let's go kinda guy. I can grumble but he just finished out his AERC 6000 miles so I couldn't be more proud. The crooked legged beast just gets the job done! What a week! It really is my favorite “vacation” of the year, although it’s much more relaxing to return to work. I was leaving Tuesday morning, but on Monday night, in yet another bay area 2017 rain storm, crash down comes a 20 inch in diameter tree in my driveway. Not across the drive way, where 4 cuts would have gotten me out, no, down the driveway, the long way. Come on! I spent 2 hours early Tuesday morning cutting it up and moving the wood so I could leave. What workout? My plan this year was to try and ride Donnie on the 100. 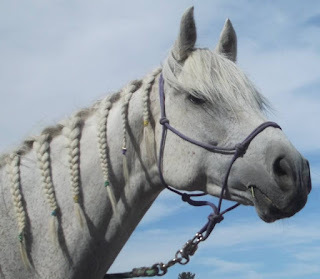 I was not sure it was a good idea, since he’s going to be 20 in a few weeks, he has not done a 100 in 3 years, (nor have I) but more specifically this is the horse I was worried might die in 2015 from the poison hay incident. I took it easy on him last year, but certainly kept him going. Ines rode him at Fire Mountain in January and he was perfect, and he just felt so good riding him at home. My Good friend and “the person who helped me get into horses” Jean Schreiber gave me some good advice. She said “try it, and you will know if he’s okay. If he’s not he will tell you. But try it while you can.” So I did. 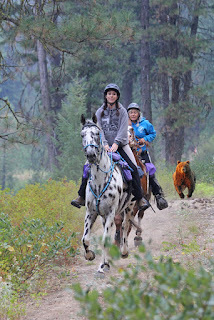 This year I trailer pooled down to the ride in my rig with Kristin Ojala and her young mare Lani, who were doing the 50. The drive down was actually un-eventful and nice; we were lucky we did not go on Wednesday. Gretchen Montgomery put me up in their house again, it’s so plush. Kristin got my camper. On Tuesday night the desert gods decided to let us mortals know who is in charge out there. They sent the wind. Thanks so much. On Wednesday I spent 7 hours doing about 80 miles out on the bike marking the trail, but could not think about the required chalk on the turns due to the wind. The wind only blew my bike over once while it was on the kick stand. I did the 35-mile loop and about a third of the 50 with ribbons, and I put up 4 signs at the trail splits way out on the trail. The really big wind came Wednesday night. Thursday morning came with a light wind - those desert gods actually showed some mercy. I went out in the morning on a borrowed quad and spent 2 hours marking in town, about 5 or 6 miles all told. Ribbons, chalk, and signs. Then Kristin, Gretchen and I went out for a 90-minute horse ride, and then it was back out on the bike to work on the 65-mile loop. I finished that up just before dark, but discovered something depressing. As I came down the common trail shared with the 35, I noticed that there were no ribbons anywhere. Oh wait, there’s a clothespin on the bush with a stub of an orange ribbon. A sixteenth of an inch long. The wind had either removed the whole thing, or blasted the ribbons right off the pin. Groan. And my signs? Somewhere near Barstow by now I imagine. That would mean another trip out around the 35 mile loop. That would have to wait, because on Friday morning, I went out on bicycles with Gretchen to mark 6 miles of trail on the pedal pushers, since the trails here in this key part of the ride were now off limits to all motor vehicles. Even mine. Have you ever tried to ride a bicycle in a sandwash? Nope, no go. We rode and pushed the VERY UNDER POWERED two wheeled thing to get the trail marked, and once done, we went and picked up the 12 bales of hay and distributed them out to all the vet checks and water stops. I made it back by 1pm, and set out on the bike (The real bike, the one with the motor!) again to re-mark a lot of the 35-mile loop. Much more like it. The ride meeting was at 6, and I made it back in time. Thanks to Kristin for taking care of Donnie for me. She moved camps, vetted him in, and removed a lot of work for me. We had the ride meeting, and then the little memorial service for Jackie Bumgardner. It was nice, but certainly sad. I went off to get ready for the ride tomorrow morning and realized I had been going hard from sunup to sunset for the past 3 days without a break, and that included 230 miles on the dirt bike. I went to bed tired, really looking forward to that 6am start on the 100. Saturday morning came perfect- cold, and light breeze. 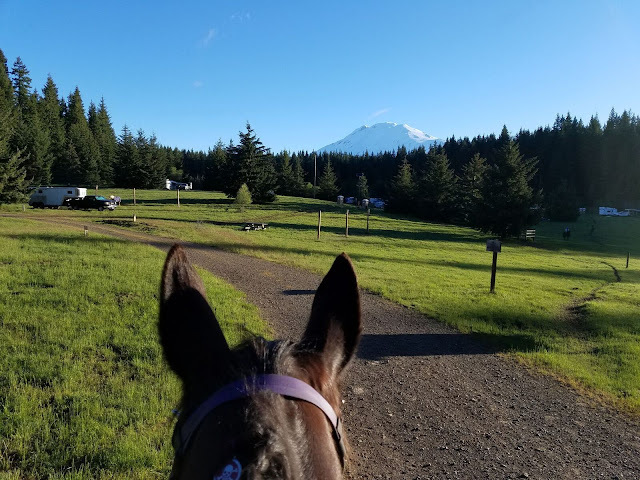 I rode out of camp with Aurora Grohman for a while, on a very cool 19 year old stallion on his first 100, but I went on ahead after a few miles. I had my first problem of the ride when my eyes started burning again, just like at Fire Mountain a month ago. It was really weird- if I was moving forward, or there was any wind, my eyes just burned, bad. I had to keep one or both closed for relief, tears streaming down my face. I had visine along with me just in case, but it just made it hurt worse. Just about 10 hours of eye pain. What a hassle. Except for my eyes, I was having a nice ride on my best boy, until I got to Rene, the photographer, at mile 10. I smiled for my pictures, but then immediately realized that I was off trail. Huh? Where was the turn into the desert? Rene told me he had been sending people down this road with pink ribbons, but they were not mine. I rode backwards, and found that that someone had removed all my ribbons, the chalk arrows, and the chalk line I had drawn all the way across the road so no one would do what I had just done. What? I rode back to where he was, and down this road marked in pink ribbon. My color. After about a half mile I ran into a sign that said “bicycles left, runners right.” Someone had another unknown event going, used pink ribbons, and took my trail down so “their” guys would not be confused. 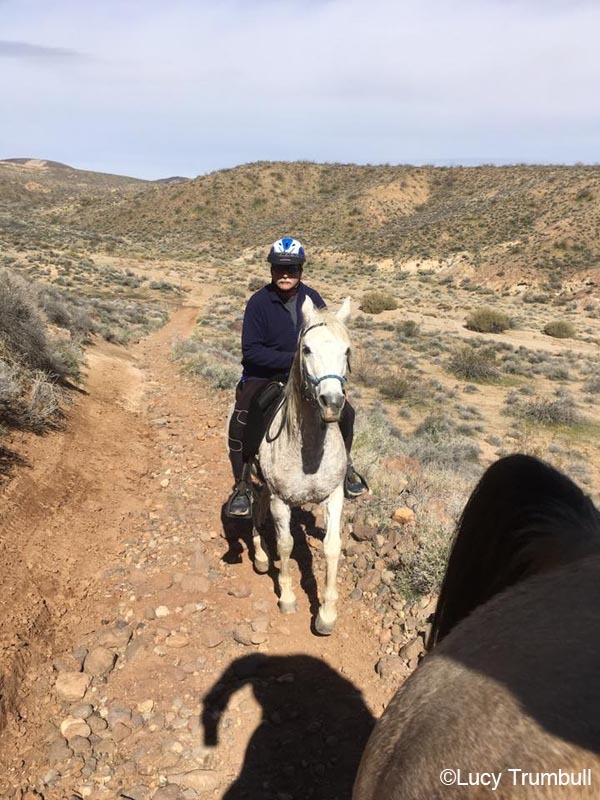 I rode Donnie frantically back out across the open desert to where my trail still had some ribbons, grabbed a bunch that were on the correct, but now inaccessible trail, rode back, and improvised our trail by using theirs, and then marking a new trail to the right to send our riders to the vet check. I had to kick away my chalk arrows, and pick up the ribbons going the other way, etc, etc. Great! I’m working on the trail during the ride. At least the 50’s had not been by yet, and I don’t think anyone got really lost here, since it was on the way and close to the 395 vet check. I was a little stressed as I rode away. I hooked up with Brenna Sullivan and we rode together off and on to the first vet check at 15 miles. No issues there except for a horse that got loose and ran through camp like he was TRYING to mow someone down. It was scary! We caught up with Lucy Turnbuckle Chipotle on her truck-size horse Fergus a couple of miles later. She was glad, as Fergus was missing some horse company. The three of us rode together for the next several hours, and I discovered my horse could not walk as fast as these two other horses. NO horse can walk as fast as these horses. It was stunning- Fergus has a big walk, and would just walk away from Donnie. As a result, Donnie would jig along to keep up while Fergus walked. Trotting was fine, but walking was a hassle. But Brenna’s horse would walk away from Fergus! I have never seen anything like that. I kid you not when I say that Donnie was trotting slowly next to her while she walked. She is a Walker, but it was really incredible. Donnie just didn’t walk during those 25 miles or so. Wow. I discovered my next problem that started making me nuts- for some reason my ankles started rolling inward in my stirrups. I stopped and looked and found the foam pads in the stirrups were collapsed and flat as a pancake on one side. I left my good stirrups with the new E-Z ride “nubby” pads on Sorsha’s saddle at home, so I used the ones that came on the new specialized. It was very uncomfortable, so I stopped every 5 miles and reversed the stirrups, which helped for a couple of miles. I would certainly swap them for something at camp, even if I had to remove the pads and ride on the plastic. We vetted through vet 3 and headed for camp, but about 5 miles away I trotted on ahead, since I was trotting anyway. Donnie was superb and blew through the check with all a’s. In camp Brenda lent me a pair of new E-Z ride stirrups with the “nubby” pads, same as mine at home, and problem solved. Yay! Thanks Brenda. Those stirrups are still on my saddle; they are not coming off. I just ordered her a new pair! I solved my eye problem by wearing my dirt bike goggles on the second loop, as I did at Fire Mountain, and that took care of my eyes. I’m going to get that checked. I waited for Lucy and Brenna, and we left camp at about 7:40 or so in the dark and headed out for our last 35 miles. With all my problems solved I had a great last loop. We just rode along together, with Donnie trotting slowly along them when they walked, which we did a lot of. The stars were stunning, and we saw several shooting stars. We had a nice ride to the last vet check at 90 miles; it was a little cold in the wind, but I was very comfortable. With about 5 miles to go, they were walking, Donnie was jigging, so I trotted on ahead like I did on the last loop and cruised into the finish at 2am. Donnie was totally fresh, with a cri of 48/48. I will admit he was fresher than I was. I was not sore, or hurt, but man, was I fatigued. I took him to roll, which he did with glee, and put him up with lots of food. The week had caught up to me, and at 2:30 am my head hit the pillow and I was out. Dead. I don’t remember being that tired in a long time. I woke up at about 7 on Sunday morning feeling a world better. The ride breakfast was perfect, being catered by a local Mexican restaurant. Boy, it was good. Someone told me that cardboard would taste good at that point, and I agree. The awards meeting was nice, we finished in 20th place of 25 finishers of 36 starters I think. Lucy and Brenna walked in and finished at about 2:45, but by then I was out cold. Poor Kristin only made it 7 miles in the 50, having to stop due to lameness in the rear on Lani. At first they thought maybe an abscess, but it looks more like the rear boots rubbing. She has some work to do to get it sorted out, but she will. Brian and Val Reeves do a heck of a job putting this thing on- it’s a lot of work; they have a core of fabulous volunteers. After the awards meeting we packed up and drove the 8 hours home, stopping once in Lost Hills for the kids, who ate a TON of green grass. To say I’m pleased with Donnie is an understatement. I won’t embellish as I’m known to do, other to say that he’s just the best. I’m going to keep riding him as long as he likes, it, and after Saturday, I’d say he’s nowhere near done. 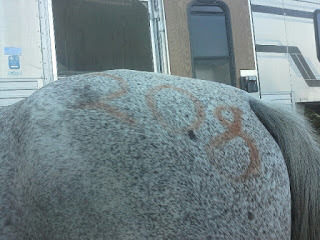 Judy will be riding Donnie at Lost Padres on the 25 on day 1 along with me on Sorsha. She will enjoy it. It would be hard not to. He’s a good horse. One rider. Three horses. And 350 kilometers of untamed terrain on the remote east coast of South Africa. 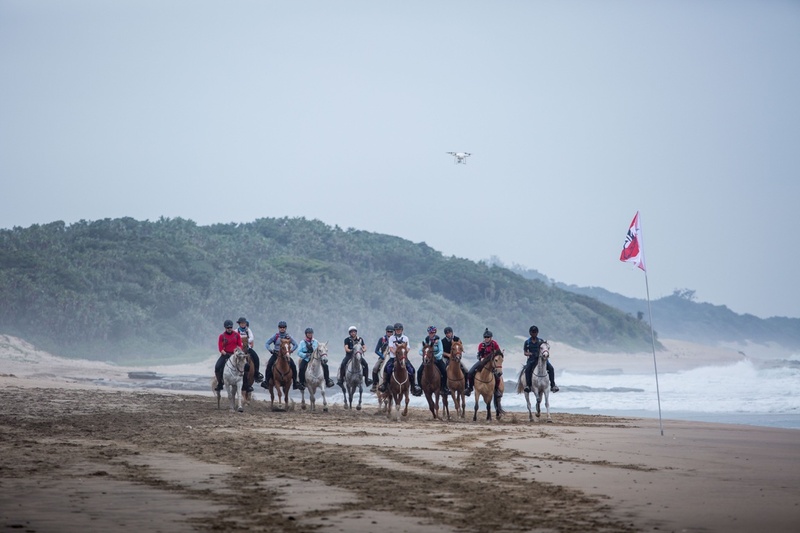 Australian Brent Albuino was among the first to brave the inaugural Race the Wild Coast last year. He won’t be the last. The crew is tramping through the sand dunes to bring us our first horses. As we await I remind Maudes that being the inaugural riders for this crazy race I feel like a bit of a Guinea Pig. The crew arrives. Pip has my horse and she looks f*d from trudging through the sand dunes. This gives me zero confidence of what’s to come as Pip is an Aussie, hard as nails, born and bred in the Pilbara. She has red dirt running through her veins and a f* you attitude only an Aussie with a can of Bundy would understand. Anthony Ward-Thomas was going to ride with Maudes and me until his horse did its best impression of a submarine on a training ride at start camp. He bailed on the race and I’m starting to think he may be the most intelligent person I’ve ever met. He was last seen drinking with the locals at Port St Johns. Nice bloke, I hope he’s ok. I get on my horse, Amir. He seems relaxed, like he has no idea he’s about to carry me through 100 kilometers of torturous terrain. 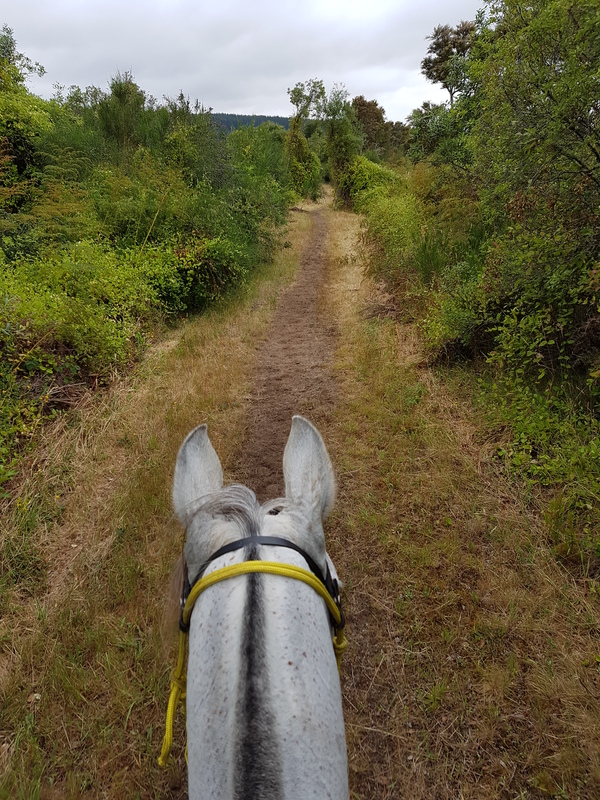 Endurance rider Jessica Aistrope shares her eventful journey across the Tasman to gain her FEI 1* qualification. 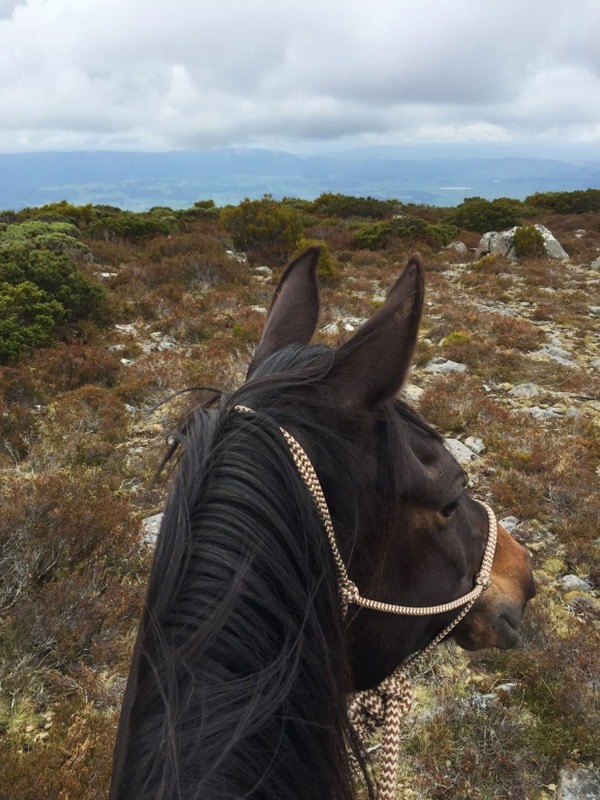 Along the way she enjoys a feast of cocktails and chicken wings in order to make the New Zealand minimum riding weight and wracks up an exorbitant data roaming bill by accident….this is her story as she tells it. "Late last year Stella Harbison and I began discussing our plans for 2017. The Tom Quilty is a major priority for me and I am the course designer and have ambitions to ride also. Stella has some amazing horses and we thought we should also try to aim for some FEI events as well as the Tom Quilty. Given my lack of participation in FEI over the years, not by choice but simply limited events to attend. I realised I had not competed in FEI since I rode as a youth in 2010. Figuring I would need to start my qualification again I began thinking of the horses Stella had for me to ride, realising we had 2 horses whom had already gained their 1* qualifications, it would be almost a waste to drive 1800+km return trip for a 1*. Stella suggested we start looking for other alternatives. Upon checking the FEI calendar I noticed NZ had a number of events scheduled before our first FEI ride in Aus. 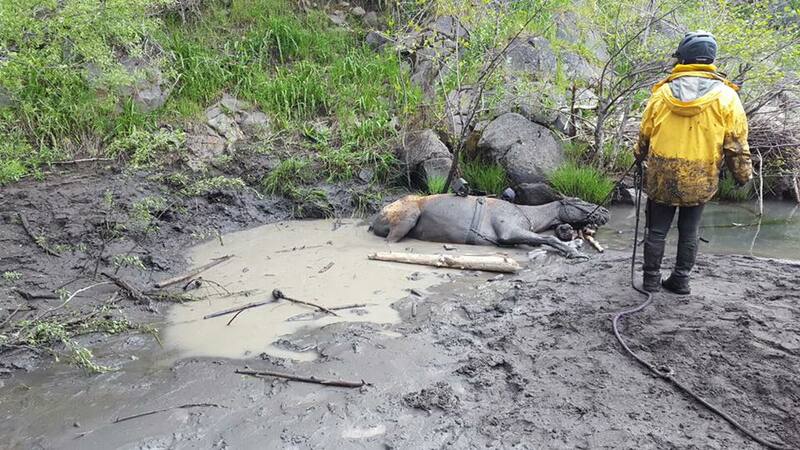 I messaged a friend Mark Tylee in NZ and explained my situation and if he could keep an eye out for a spare horse if ever the opportunity arose.